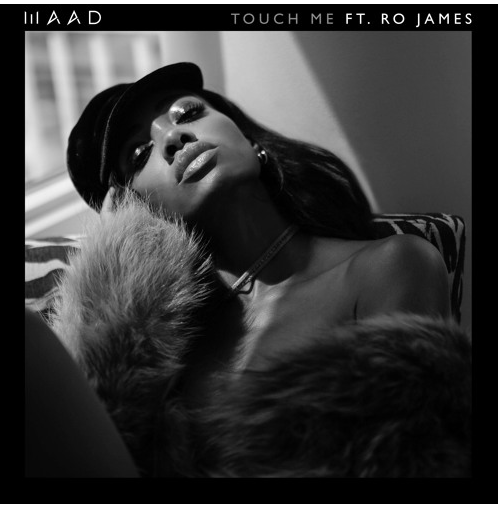 NYC based singer-songwriter, DJ and model MAAD continues her unstoppable rise on the music scene with the release of her new track ‘Touch Me’ featuring the Grammy nominated soul artist Ro James. The track is the follow-up to ‘90s Love’ – which was released towards the end of 2016 and has amassed over 100,000 streams – and will feature on her highly anticipated debut EP, ‘Le Funk’. Written by MAAD and Ro James and produced by her regular collaborators TheVAMP, the breathtaking and sensual cut evokes epic soul and funk slow jam classics, showcasing MAAD’s stunning vocal, versatility and outstanding songwriting talent. Up-and-coming alternative R&B and soul singer Ro James saw his star rapidly rise in 2016. The Stuttgart born and New York raised performer is best known for his single ‘Permission’ which reached the Top 40 on the US Hot R&B/Hip-Hop Songs chart, has been nominated for a Grammy for ‘Best R&B Performance’ alongside the likes of Rihanna, Solange and BJ The Chicago Kid and was praised by Rolling Stone where his debut album ‘Eldorado’ was named one of the ‘Best R&B Albums of 2016’. Also nominated for a 2017 NAACP Image Award for ‘Outstanding New Artist’, this week he starts his first headline US tour which follows his opening slot for Mary J Blige and Maxwell on their ‘King and Queen of Hearts Tour’. Having spent recent years modeling for top publications and brands such as ELLE, NYLON, Seventeen and Anastasia Beverley Hills, along with songwriting alongside the likes of Claude Kelly (Britney Spears, Jason Derulo), TheVamp (Ne-Yo) and Jonas Jeberg (Nicki Minaj, Demi Lovato) and collaborating with internationally renowned rap artist A$AP Ferg, MAAD has firmly set her sights on the spotlight with her blossoming solo career – and with outlets from Noisey, Earmilk and The 405 to Wonderland and MTV already tipping her for big things she is set to truly make an impact in the lane she is steadily carving for herself. With MAAD’s debut EP ‘Lé Funk’ due for release soon and more new music and visuals to follow throughout 2017, MAAD is on a one-woman mission to bring throwback funk and soul influenced sounds back to the forefront of the music scene.